As evidence has accumulated in support of the Big Bang theory, the theory has come under increasingly close scrutiny, as are all scientific theories. Questions have been raised for which the theory provides puzzling or even contradictory answers. The questions are posed in the form of problems: the flatness problem, the horizon problem, and the monopole problem. Solving these problems requires an extension of the Big Bang called inflation: a theory that the universe began by expanding exponentially in size. Observations in astronomy, by 1981, revealed that the universe is almost flat, where flat means that parallel lines in space are always parallel. 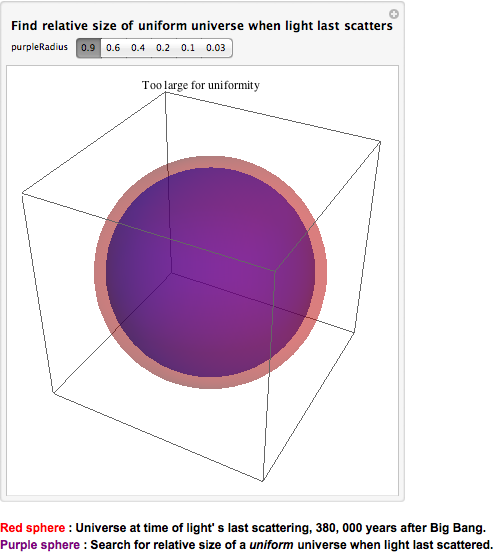 Surprisingly "almost flat" creates a difficulty for the Big Bang theory. Today's flatness is measured by the parameter Ω0 (omega naught), and an almost flat universe today means that Ω0 has a value near 1, maybe as small as 0.5 or maybe as large as 1.5. Because the universe is expanding, a natural question to ask is "has the universe always been nearly flat, or has it become flat by expanding"? Answering the question is not difficult, using the Big Bang theory, but the theory's answer is a surprise and is unsatisfactory. You should notice that at the "Earliest Possible Time," the universe is flatter than at any later time, as measured by the closeness of earlier values of Ω to 1. But is this sensible? Wouldn't you expect the universe to become flatter as it expands, in the way that a large ball has a flatter surface than a small ball's? Aside from the ball analogy, is it likely that the universe is almost flat to so many decimal places at an earlier time, but isn't exactly flat? Cosmologists have reasoned that it is unlikely that the universe becomes less flat as it ages. What is more likely is that the universe is exactly flat (Ω=1), but this is not what the Big Bang theory demonstrates. This is called the flatness problem. Electrons, protons, and photons (particles of light) form a "soup" of particles vigorously colliding with each other above 3,700 K. As the universe cools down to 3,000 K, electrons combine with protons to form hydrogen atoms, and when that happens, 380,000 years after the Big Bang, light no longer scatters and is free to stream to today&apos;s observers as Cosmic Microwave Background (CMB) radiation. Observation of the CMB gives valuable data about the time of light&apos;s last scattering. For example, the CMB is observed to be uniform over the entire sky, implying that the temperature of the universe today (2.7 K) is the same everywhere, and was the same (3,000 K) everywhere at the time of last scattering. But is it reasonable that the temperature should be virtually the same over the vast distances of the entire universe? Today the universe is so large that light has traveled a distance of 45 billion light years since the Big Bang (today's horizon distance), so astronomical objects farther than this (beyond the horizon) cannot be observed. At light&apos;s last scattering this distance was only 40 million light years because of the smaller size of the universe. But, according to the Big Bang theory, uniformity could exist at the last scattering time only over a distance of 1 million light years (the horizon distance, 380,000 years post Big Bang). So at the time of light&apos;s last scattering, uniformity over a distance of 40 million light years was impossible. Therefore, according to the Big Bang theory, temperatures at two points separated by distances greater than 1 million light years (larger than the horizon distance) should not be the same. This is called the horizon problem, and it is illustrated by the demo below. Both the flatness and horizon problems are revealed in the context of the standard Big Bang theory as shortcomings of that theory. The monopole problem, however, is not part of the Big Bang theory at all. It is a problem that arises when cosmologists attempt to construct a theory that goes beyond the Big Bang to extremely early moments in the universe. The monopole problem can be understood by anyone who has ever played with a bar magnet with north and south poles stamped on the magnet. All magnets have north and south poles (they are alternated multiple times on refrigerator magnets), and these opposite poles attract. But in the ambitious early universe theories that aspire to go beyond the Big Bang by unifying electricity and magnetism with nuclear forces (called Grand Unified models), the magnets have only one pole (a monopole), inconsistent with what&apos;s found in nature. Tackling these problems is made easier by imagining a solution to the monopole problem first, and the only solution is to eliminate the monopoles because they are not found in nature. Elimination, however, can also be accomplished by expanding, i.e. inflating, the universe to such a large size that the number of monopoles to be found in any given volume is essentially zero. Problem solved, apparently. But without mathematical expression of the inflation idea, this solution is just a daydream. We&apos;ll express inflation in math terms to solve the horizon problem. Consider a time (the Grand Unified Theory or GUT era) 10−34 seconds after the Big Bang, when the universe size (scale factor) was a tiny 2×10−27 times its current size (=1). 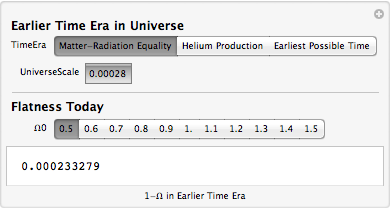 At that time, today&apos;s 45 billion light year horizon distance was reduced to 0.9 meters. But the horizon distance at 10−34 seconds is only 6×10−26 meters, the horizon problem once again: 0.9 meters >> 6×10−26 meters. What&apos;s needed is for a horizon distance today, extrapolated back to a past time, to be smaller than the horizon distance at that time. Inflation models create the appropriate conditions by proposing that our universe began at the incomprehensibly small size of 3.3×10−44 meters at 10−36 seconds, then it undergoes exponential growth (inflation) until 10−34 seconds to a size of 0.9 meters. At 10−36 seconds, however, the horizon size is 6×10−28 meters. We&apos;ve finally reached the condition that the horizon distance is larger than our current horizon, extrapolated back in time: 6×10−28 meters >> 3.3×10−44 meters. Therefore, the incredibly tiny universe from which our universe has grown has the same temperature everywhere, explaining why the temperature in our present universe is a uniform 2.7 K everywhere. Inflation also solves the flatness problem by exponentially growing the initial tiny universe out of any curvature, in the same way that the surface of a sphere becomes flatter as it becomes larger. Even though the inflated region has a uniform temperature, there are very small fluctuations from uniformity that also grow exponentially and are eventually detectable as fluctuations in the Cosmic Background Radiation.